A Monument to Dr. O. 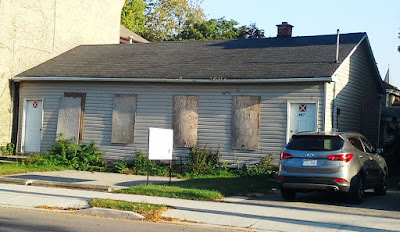 The owners of this home at 172 Central Avenue have applied for a demolition permit. A great pity, because the home is of significant national historic importance. 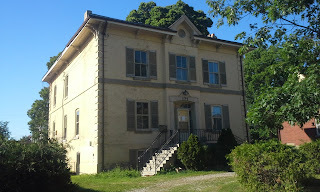 It was the London residence of the Mohawk physician, Dr. Oronhyatekha. Dr. O was a remarkable man. Born on the Six Nations Reserve near Brantford, he went on to become the first indigenous Canadian to attend Oxford University. He was the second individual of indigenous descent to become a physician in Canada and practiced his profession right here in London. On top of that, in 1878 he applied to become the first non-white member of the Independent Order of Foresters (IOF), a fraternal and financial institution. By 1881, he was IOF's Supreme Chief Ranger, a position he held for 26 years. During that time, he enforced rigorous medical underwriting procedures and expanded the IOF's product offerings. Between 1881 and 1907, the year of his death, the organization grew from fewer than 500 members to more than 250,000. In 1889, Dr. Oronhyatekha moved to Toronto where IOF had relocated. In Toronto, Dr. O. has been honoured with a Toronto Historical Board plaque dedicated in 1995. The house he rented at 209 Carlton is listed in the Cabbagetown Heritage Inventory and a nearby street has been named Doctor O. Lane. 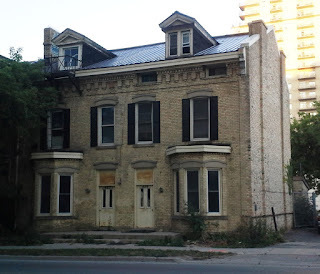 Unfortunately, his London home - this well-built, sturdy Italianate-style structure built about 1881 - is looking shabby. What the owners intend to do with the property once they've demolished the house has not yet been revealed. The City of London must turn down this demolition request. To do otherwise sends a message that London doesn't value the contributions of the indigenous community, a sad statement in this era of supposed reconciliation. Let's get this message across at the Planning and Environment Committee meeting at City Hall, Monday July 16, 2018, after 4:30 pm. Letters of support may be sent to the committee secretary, Heather Lysynski, at hlysynsk@london.ca. Update: PEC voted 5-0 in favour of turning down the demolition request and designating this building. Next step is for the issue to go before full Council on Tuesday July 24. The owner was planning on redeveloping the site with what he termed "infill," merely saving the facade of the house. But infill means developing a vacant lot by inserting a building sympathetic to the neighbourhood, not tearing down an old structure and rebuilding on the same site. July 24: City Council voted 15-0 to designate. Stay tuned. The London Free Press building at 369 York Street is going to be renovated as Venture London, a small business and innovation hub that will support start-ups. Farhi Holdings, the current owner of the building, will partner with TechAlliance, the London Small Business Centre and the London Institute to develop the multi-million dollar renovation. The building may open as early as this year with amenities such as an indoor event space, rooftop patio, and catering facility. 1. 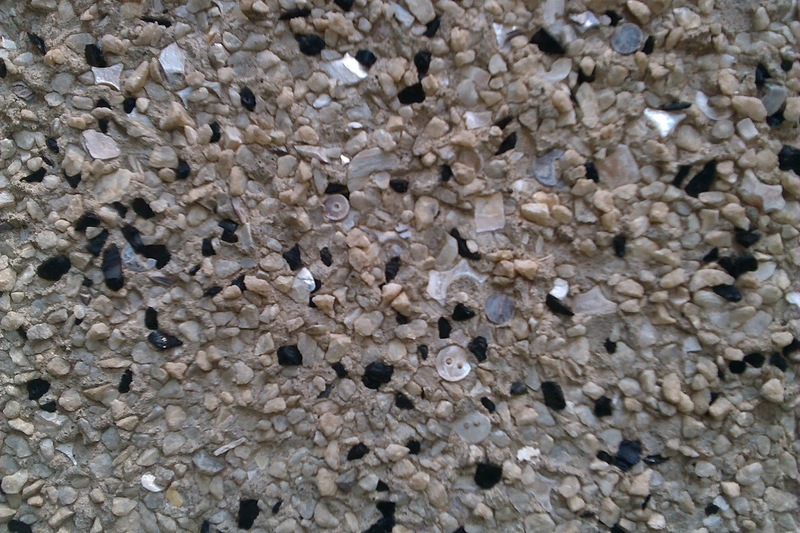 Reusing a building conserves natural resources, since it minimizes the need for new materials. If we recycle pop cans, why not buildings? Adaptive reuse is an important aspect of the green movement. 2. Adaptive reuse is often more economical than starting fresh. While the final bill for this project is unknowable at this point, renovation is likely cheaper than if the partners were to build from scratch. 3. The project may help revitalize this rather uninspiring section of York Street near the railroad tracks. I often walk about downtown but, at the moment, this area doesn't have much to recommend it for a stroll. 4. The Free Press building was constructed in 1965 when the newspaper needed more space than was available at their previous Richmond and Queens location. As a mid-twentieth century building, 369 York Street has never struck me as one of London's most attractive buildings. The refurbishment may actually make the structure more inviting. 5. Preserving the Free Press building saves the memories of many current and former Free Press employees, who may have been saddened if their former haunt had sat empty, gradually falling down, and possibly being demolished. Update, April 11, 2018: More good news for adaptive reuse: local schools that will soon close could help London develop more affordable housing. London Council has just approved a surplus school strategy that may allow schools to be transformed into affordable housing projects, community centres, or parks. Time will tell if the finished results are beautiful buildings, but it's another step in the right direction. 467-469 Dufferin Avenue may not look newsworthy. But another London heritage battle is looming over this one-storey vinyl-sided building on the south side of Dufferin between Maitland and Colborne. Marigold Homes wants to replace it with a 3 1/2 storey apartment building with 12 "microsuites." According to a Free Press article, the owner, Ben Lansink, thinks it's "awful looking" and "beyond repair." Of course, he's let it deteriorate to its current condition himself. He also claims the design for the new building will "fit in" with the historic neighbourhood, although no new design is going to fit in like the real historic building that's already there. The issue is not whether there could be a demand for microsuites, or tiny apartments, in the core. I'll bet there is. But the place for them is not on the site of what may very well be one of the oldest buildings in London. This may be one of the original British military barracks buildings, moved here about the time the military base closed to become Victoria Park. City records show the building has been on this site since 1874, coincidentally the year the barracks buildings were sold to be moved elsewhere. The building might date to as early as the 1840s but, of course, without a detailed inspection of the interior it's difficult to say for sure. Furthermore, 467 was the first office of the London District Trades and Labour Council as indicated by old city directories. This is West Woodfield Conservation District. The point of conservation districts is to conserve heritage. There isn't much point in creating Heritage Conservation Districts (HCDs) if the city is going to allow property owners to demolish the buildings within. Make changes to buildings, yes. Create sympathetic additions, fine. But not demolish the oldest, most historic structures we have. Let's hope the city agrees the microsuites should be built elsewhere. Otherwise, we have a precedent for the further erosion of the heritage resources within Woodfield. Once this building comes down, why not others? Update, December 2017: The city's Planning and Environment Committee (PEC) has turned down Marigold's request to build microsuite apartments on this site. Not because PEC thinks the building is worth saving but because the planned apartments would create too much intensification in the area. 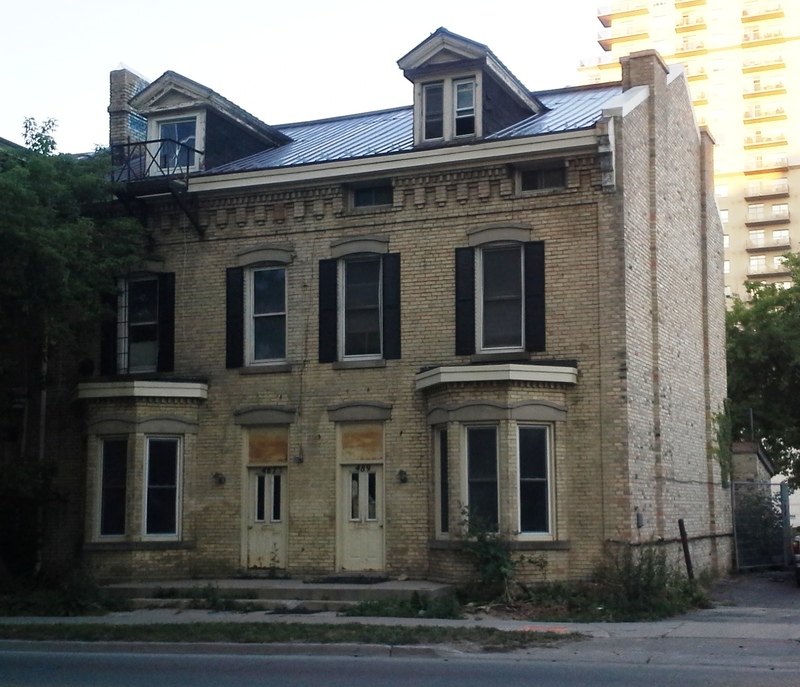 While the decision saves 467-469 Dufferin for now, how much longer will it be allowed to deteriorate? Update, January 2018: Once again PEC has turned down Marigold's demolition request. Stay tuned. There was a time when Lambeth students wishing to further their education after elementary school had to take the traction line to London or board in the city. The building known as the Lambeth Continuation School came to their rescue when it opened in 1925 to teach Forms 1 to 4, later called Grades 9 to 12. Students taking Grade 13 still had to go to London. After the continuation school closed in 1949, students once again headed into the city to attend high school. The building then became S. S. # 17, later known as Lambeth Public School. In 1965 its name changed again to M. B. McEachren School after a dedicated teacher named Margaret B. McEachren who taught there for 23 years. Additional classrooms and wings were added over the years. 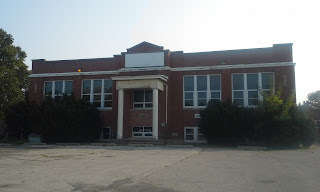 Declared surplus by the Thames Valley District School Board in 2010, the old school has been owned by Lambeth Health Organization since 2015. Their plan is to demolish the building and build a medical centre on the site. The proposed building intentionally pays tribute to the school, with its red brick horizontal appearance. But why build something similar when you could just renovate the original? On September 11, 2017, London City Council's Planning & Environment Committee (PEC) voted to remove the school from the city's heritage inventory list, just one year after city politicians voted to preserve it as a heritage property. Odd, since the heritage value hasn't changed. And Lambeth isn't overly endowed with heritage buildings. All of this leads to the question, what does our society do with all its surplus schools? There are a great many of them everywhere, due to the decline in enrollment. Not surprising - the baby boom is over. Since 2006, the TVDSB has closed 33 schools. 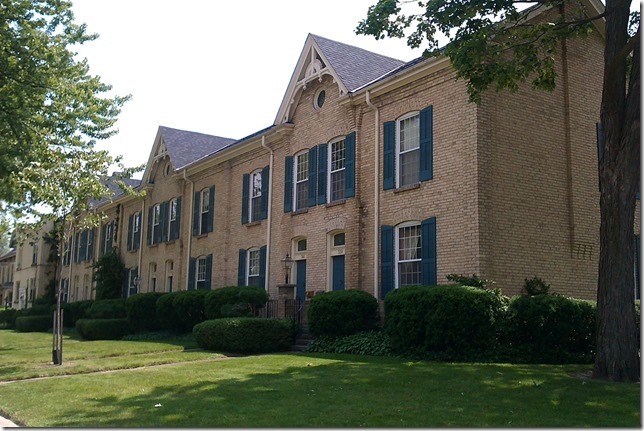 (For pictures of schools recently sold, see here.) Not all of them are architectural gems, of course, especially the ones built in mid-20th century which usually look like concrete bunkers. It would be difficult to justify saving all of them, especially since many sit on valuable land in key locations. But the older heritage schools with style are more worth preserving. McEachren School - like quite a few others - could be renovated into a health centre, community centre, offices, shopping centre, college, apartments ... Just look here, here, and here. (OK, the last link shows the school being demolished but it was certainly successful for a while, each classroom being a separate shop). Personally, I'd like to move into the McEachren Apartments. Update, September 20, 2017: City Council has decided to designate the school property with Councillor Jesse Helmer suggesting the building be renovated for a new use. We've been hearing lots about the London Plan the past few years. It's the plan for London's future development that replaces urban sprawl with infill. Basically, it means that a new highrise will be built on a plot of land downtown rather than the city’s edges. Infill is a great idea. It's better for the environment since farmland isn’t eaten up by housing subdivisions and strip malls. And it's less expensive for taxpayers because services such as water and sewers already exist within the city. I support infill development so long as heritage buildings aren't demolished, since I believe our downtown needs a balance between old and new. The London plan was created by Londoners themselves, during more than 150 community meetings in which about 14,000 Londoners contributed their ideas for the city's future. City council unanimously approved the final draft and even the provincial government approved it. Unfortunately, the plan is now endangered by 42 appeals to the Ontario Municipal Board. So what is this Ontario Municipal Board or OMB anyway? It was established in 1906 as the Ontario Railway and Municipal Board, mainly to oversee expanding rail systems between and within Ontario communities. Taking its current name in 1932, the OMB has evolved into a quasi-judicial body overseen by provincial appointees, adjudicating land-use decisions throughout Ontario. 1. It seldom supports the little people. Sometimes the OMB seems to exist to allow prosperous landowners to topple planning decisions they don’t like. Property developers appear to have a better chance at the OMB because they have the financial resources to hire top lawyers. Decisions rarely seem to be in the best interest of neighbourhoods or the average London taxpayer. 2. It's a waste of time. Often development plans are stalled until OMB decisions are handed down. In the case of the 42 appeals to the London plan, the issues may not be resolved for years. Do OMB members, located in Toronto, understand local situations and concerns? Hardly. Nor do they want to. The Board subordinates local policies to ones of its own making. In an ideal world, once a decision has been made locally, that should be the end of the matter. The city should be able to decide for itself what it will build and where. 4. It encourages municipal politicians to make decisions for the wrong reasons. Municipalities may be tempted to make decisions that will avoid OMB hearings, just to sidestep the costs or the wasted time. In other words, politicians will just do whatever developers want. Members of the OMB aren't elected. So an unelected board controls the majority of Ontario developments instead of our elected municipal councils. If the OMB makes a decision voters don't like, there's no way to vote its members out. I find it bizarre that most decisions made by London City Council - whether they be about rapid transit, on-street parking, noise levels, snow removal, or just about anything else - are binding and final. But when it comes to land use, a bunch of people in Toronto are allowed to dictate what happens here. Some might say the OMB needs an overhaul. But Ontario is the only jurisdiction in North America with a Municipal Board, so why don't we join the rest of the continent and abolish it altogether? Unfortunately, I'm not quite sure how to begin. Any ideas? Update January 2018: The OMB is to be replaced by the Local Planning Appeal Tribunal (LPAT) in 2018, which will have more limited powers. 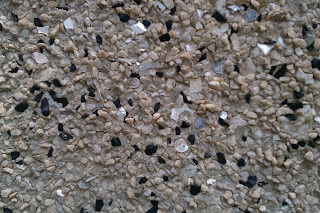 Look closely at this stucco covering a house on Elias Street, just east of Adelaide in Old East Village. See the buttons? Local tradition says they came from a nearby button factory.﻿ Does anyone know where the factory was and when it operated? A 19th-century term for row housing, terrace housing refers to identical or mirror-image houses sharing side walls. Such terraces were a traditional British form of domestic architecture generally only found in the larger urban areas of Ontario. London has several examples. One of the loveliest, 339-349 Princess Avenue (left), known as Princess Terrace, was built in about 1886 in the High Victorian Style. The roof line is broken by three gables with decorative wooden details and round windows. There used to be porches but they were removed during renovations. Still attractive though. A sad example is Camden Terrace at 479-489 Talbot Street (right), built 1876-77. The buildings, owned by Rygar Properties, have suffered from neglect for years. Rygar intends to demolish the terrace and build three residential towers on this site, incorporating a rebuilt facade of the terrace in the lobby. This, of course, with London city council's blessing, since the majority of councilors voted in favour of demolition on September 13. Take a look while you still can. 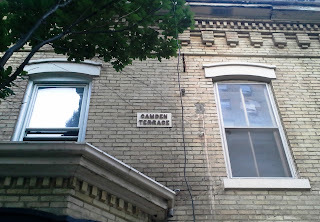 The Camden Terrace situation raises the issue of infill development in London's core. How much do we want, where do we want it, and what should it look like? How many heritage buildings will be lost to highrises? Update: Demolition of CT began in November 2016 and is now complete. RIP. August 2018: And Rygar has not yet started building on this site.